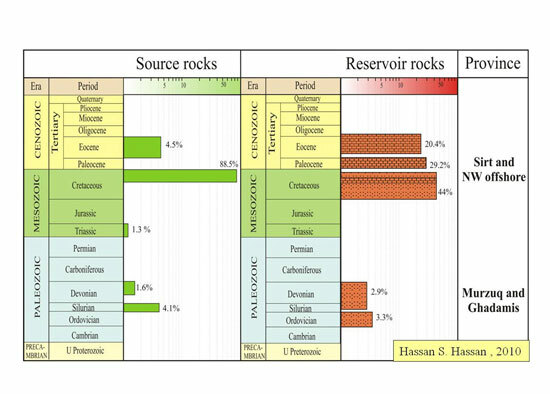 This set of pages introduce the geology of Libya and its petroleum resources with links to maps and cross sections assembled from a variety of publications and geological sources by Hassan Salem Hassan (Swalem to his family), for his PhD geological studies at the University of South Carolina and his academic adviser Christopher Kendall. 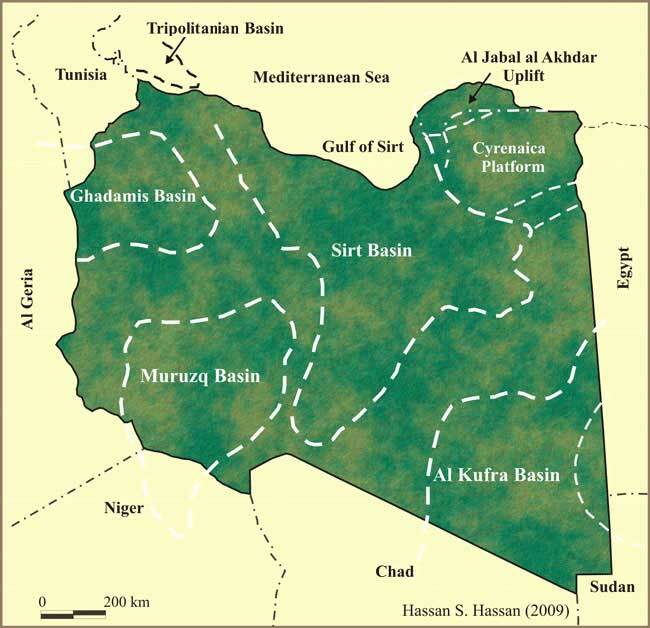 The main producing basins of Libya are in order of importance the Sirt, Ghadamis, Murzuq and the offshore Tripolitanian basin. Location of major sedimentary basins of Libya (click on hot spots on map to visit pages). Epirogenic movements with vertical nature are limited to uparching and faulting and included Mesozoic-Tertiary basins of Sirt and Cyrenaica (NE Libya). Tectonic movements occurred in northern Libya were responsible for the large sedimentary sequences in Libyan basins. The generation and entrapment of hydrocarbon in Libya was controlled by the tectonic history of each individual basin. According to Energy Intelligence Research, in 2003 Libya was the 11th largest exporter of petroleum in the world. Libya reached the peak of 3.3 million barrels a day in 1970 and currently produces only about 1.7 million barrels of crude a day. According to NOC, only around 30 per cent of Libya has been explored for hydrocarbons, Libya wants to return production to that peak level by 2010. There are about 320 producer field with total reserve exceed 50 billion barrels of oil and 40 trillion cubic feet of gas. The Ghadamis intracratonic Basin consists of up to 6000 m of dominantly clastic Paleozoic through Mesozoic strata with an estimated 3 billion bbl of recoverable oil. The Upper Silurian Akakus Formation and the Tadrart - Ouan Kasa Formations are the most prolific oil producing horizons. The Muzurq Basin is filled with Cambrian through Quaternary deposits, with a maximum total thickness of more than 3000 m in the central part of the Basin. In the area to the north, where oil reserves are some 1 billion barrels, the potential reservoirs include the Memouniat, Acacus and Tadrart- Kasa sandstones. The major source rock in this Basin is the Silurian Tanezzuft Shale. To the present time no commercial discoveries have yet been made in the Mesozoic-Tertiary rocks of Cyrenaica and Paleozoic of Al Kufra Basin. However recent work on stratigraphy and geochemistry of the Cyrenaican Platform suggests the probability of major potential reserves of oil and gas from Cretaceous and early Tertiary Rocks. Similarly the Devonian sandstone have been found to contain some gas shows in central Cyrenaica. The offshore Basins are considered to be highly prospective but has been exposed to only limited exploration to date. The major offshore oil production is in the Tripolitanian Basin from the El-Bouri oilfield that is producing about 60,000 bbl/d, with an estimated 2 billion barrels proven recoverable crude oil reserves. On December 17, 2008, Hess Corp. reported an exploratory well has encountered a 500-ft gross hydrocarbon section at various intervals in an offshore extension of the Sirt Basin. A slump structure exposed on the coast of northern Cyrenaica (Al Jabal Al Akhdar) with Hassan Salem Hassan providing the scale. The Cyrenaica region has been unstable since the initiation of an inversion of the topography in Santonian time when the Al Jabal Al Akhdar was uplifted. This event was undoubtedly responsible for the folding of the Late Cretaceous-Early Tertiary rocks of northern Cyrenaica. The presence of contorted beds in the figure matches that seen in more than two horizons of Al Athrun Formation. The structures above are characteristic of a gravity induced soft sediment slump, probably in a slope setting, suggesting a continuation of tectonic activity during Campanian time.